Patrick Reymond took Nick Trost's delightful packet trick and added a wonderful new climax that makes it perfect for restaurants! 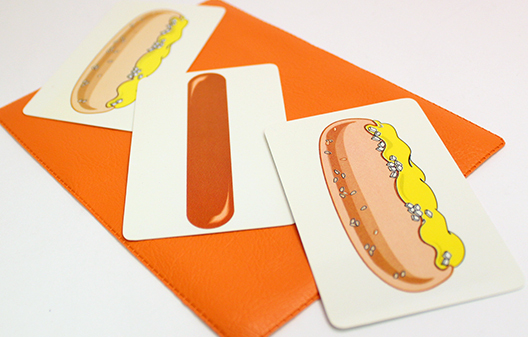 3 cards are shown, 2 with pictures of a hot dog bun, the other with a hot dog. Upon sandwiching the hot dog between the buns, the magician is able to stretch it to twice its normal length! Then, in an effort to get the hot dog back to normal size, he mimes biting off the ends, leaving a hot dog with both ends bitten off on the card! It's visual, and great for kids in a restaurant! Comes with cards, printed on credit card stock to last a lifetime, and a downloadable instruction booklet by Gary Ouellet. Community questions about Hot Dog!